Among Low-Risk Emergency Department Patients: The PROPER Randomized Clinical Trial. JAMA February 2018. 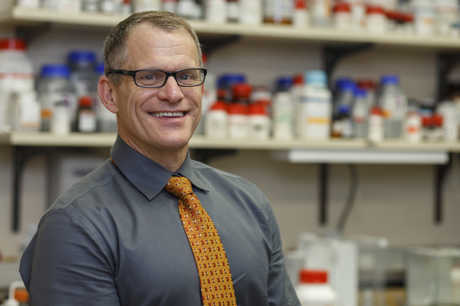 Guest Skeptic: Dr. Jeffrey Kline (@klinelab) is the Vice Chair of Research in Emergency Medicine and a professor of physiology, Indiana University School of Medicine. He is the editor in chief of AEM, creator of Pulmonary Embolism Rule-out Criteria (PERC) Rule and has published extensively in the area of pulmonary emboli. 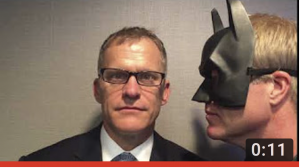 We have even made a Batdoc Video together on pulmonary embolism. Case: A 47-year-old woman presents to the emergency department with a 24-hour history of chest pain and shortness of breath. She has a past medical history of hypothyroidism and gastroesophageal reflux disease. She is on levo-thyroxine and a proton pump inhibitor. Vital signs are normal (HR 72, BP 130/80, RR 12, O2 Sat 97% and 37.1C) and physical examination does not indicate the cause of her complaint. ECG, chest x-ray and routine lab work is also normal, including a troponin. You risk stratify her by gestalts and Well’s criteria as not high risk and wondering if you can PERC Rule her out and not order a d-dimer. 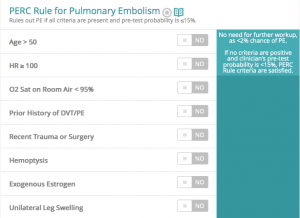 Background: The Pulmonary Embolism Rule-out Criteria (PERC) Rule is an eight-item clinical decision instrument. The eight-items include the following clinical criteria. If the answer to any of these questions is positive a d-dimer is indicated. Listen to the podcast on iTunes to hear Dr. Kline discuss some background information on the diagnosing of pulmonary embolism and the PERC Rule. The History of the PERC Rule – How did it come about, why eight-items instead of five and when did you publish the first PERC paper? The Controversy of its Use in Europe – Why do the Europeans seem not to like the PERC Rule? The Power of Gestalt – How does it compare to risk stratifying tools like Well’s Criteria? The Inference about Sub-Segmental PE and Possible Over – Diagnosis? How to Use PERC Rule and Why this Differs from YEARS? Clinical Question: Does PERC Rule work in France? PROPER stands for PERC Rule to Exclude Pulmonary Embolism in the Emergency Department. It was a crossover cluster-randomized clinical non-inferiority trial conducted in France. Population: Adult patients presenting to the emergency department with low gestalt clinical probability pulmonary embolism. 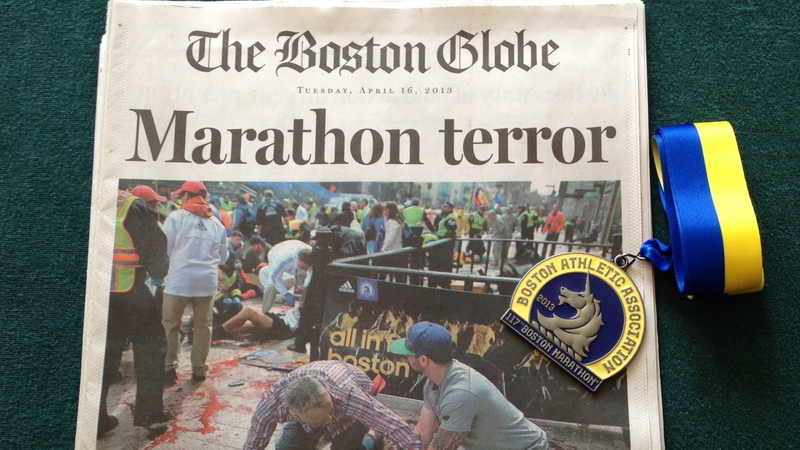 Inclusion: New-onset presence or worsening of shortness of breath or chest pain and a low clinical probability of PE, estimated by the treating physician’s gestalt as an expectation below 15%. Exclusion: Obvious etiology to the acute presentation other than PE (eg, pneumothorax or acute coronary syndrome), an acute severe presentation (hypotension, SpO2<90%, respiratory distress), a contraindication to CTPA (impaired renal function with an estimated creatinine clearance <30 mL/min; known allergy to intravenous radio- opaque contrast), pregnancy, inability to be followed up, or if they were receiving any anticoagulant therapy. The only missed pulmonary embolism or failure of the PERC rule to identify a PE that occurred in this study was that of a young male with chest pain and no previous medical history. He was PERC-negative and initially dis- charged but then seen again the next day with ongoing pain. When he presented the second time, a D-dimer was checked and found to be positive followed by a CTPA, interpreted as inconclusive, with radiological signs consistent with pneu- monia. The patient was admitted, had lower-limb Doppler ultrasonography that showed no VTE and then a V ̇/Q ̇ scan showed subsegmental defects. He was treated with direct oral anticoagulation for 6 months and had a normal scan at follow up after conclusion of therapy. Listen to Jeff respond on iTunes to the five nerdy question. Low Prevalence: These were very low risk PE patients because only 2.7% (26 patients) in the control group were diagnosed with a PE in the initial ED visit. Wouldn’t any strategy look good with such a low prevalence rate? Non-inferiority: This was a non-inferiority design. One of the threats to this design is the loss to follow-up. A total of 54 patents were lost to follow-up in the trial. Worst case is that all of them had an event and that would have breached the upper margins set for the 95% confidence interval of 1.5%. Intention-To-Treat vs. Per-Protocol Analysis: They did both forms of analysis. Can you comment on the strengths and weaknesses of each type and how we should interpret the results? Miss Rate: What is an acceptable miss rate? In the USA there seems to be a zero-miss rate culture. While the failure rate observed after a negative CTPA is about 3% you are more likely to get in trouble if you miss a PE and you did not do a CTPA then if you miss a PE and you did do the CTPA. Clinical Decision Tools: These tools go through typically go through a derivation study followed by validation studies. Few ever make it past this stage and have impact analyses performed. Do you consider this an impact analysis of the PERC rule and what other research would you like see done? SGEM Bottom Line: Risk stratify your patients and use the PERC Rule for those that are not high-risk. Case Resolution: The patient is Well’s criterial non-high risk and PERC Rule negative. You explain this to the patient and discharge her home with a diagnosis of chest pain not yet diagnosed. Clinical Application: This study validates the PERC rule can be used to decrease the number of patients getting a CTPA without increasing the PE miss rate. What Do I Tell My Patient? We looked into why you are having some chest pain and shortness of breath. The tests show us you have not had a heart attack and have a less than 1% chance of having a blood clot in your lungs. 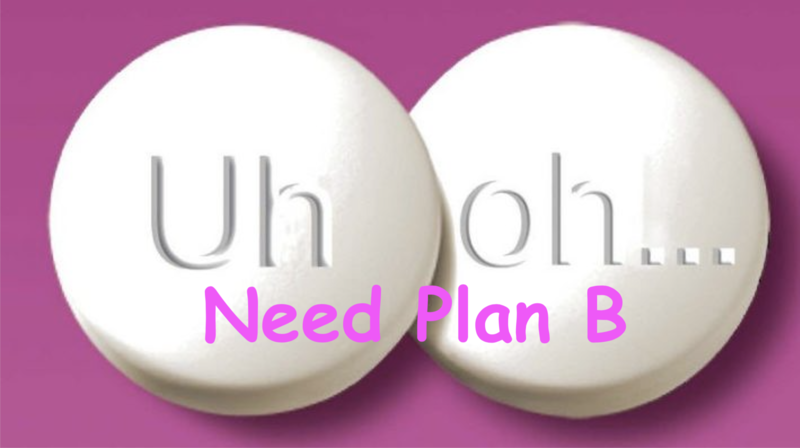 You can go home and try some acetaminophen or ibuprofen for the pain. Please follow-up with your family physician next week. If your pain gets worse, you develop new symptoms (fever, bloody cough, rash, etc) or are worried, we would be happy to see you again in the emergency department. Keener Kontest: There was no winner last week. We anted to know two out of the three diagnoses proposed by Luther Bell in his 1849 article on a condition that was coined “Bell’s” mania. These included: delirium tremens, meningitis/inflammatory conditions of the brain and advanced typhoid. 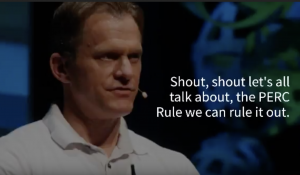 PERC Rule Music Video: We had the world premiere of the PERC Rule Music video at SAEM18. Thank you to Casey Parker who helped with the lyrics and Gerry Considine who recorded the amazing vocals. It was a parody of the excellent song by Tears for Fears called Shout. You can watch the video on Youtube or click on the picture. Facebook Live: We also recorded this episode on the SGEM’s Facebook page. If you want, you can watch the video from SAEM.